And no, you silly drunken readers, I don´t mean THAT kind of blackout. Last weekend Tyler and I ventured to Panajachel to run some errands. While there, we found an internet connection and started posting pictures. There was much rejoicing as the pictures started flowing up into Flickr. But then, after a few quick pictures suddenly the power went out. Throughout the entire village. For the rest of the afternoon. So, with only a couple of our least interesting pictures up we´re once again stalled out. 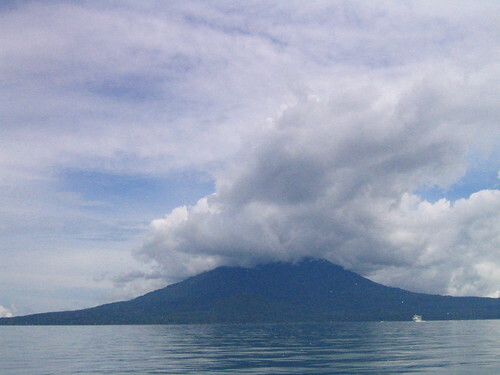 I´ve updated one of the old posts (with my ugly mug), and posted this one of the boat ride to San Pedro (under the Volcano San Pedro, which this is a picture of). But now we know where to go and it´s only a twenty minute boatride away. Life hereabouts is going really well. We were lucky enough to arrive in San Pedro a week before their weeklong annual festival. So we got to see the preperations and now we get to frolic in the crowded blissful chaos. For example, last night, I rode on the scariest amusement park ride of my whole life. And I´m no slouch when it comes to taking on roller coasters or bafflingly centripetal rides. 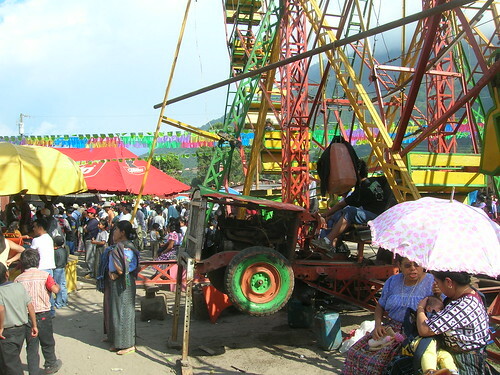 And I´ll bet you are curious what the most terrifying ride I´ve found in all my travels? It´s a ferris wheel. Yup, a ferris wheel. And not even a huge one at that. 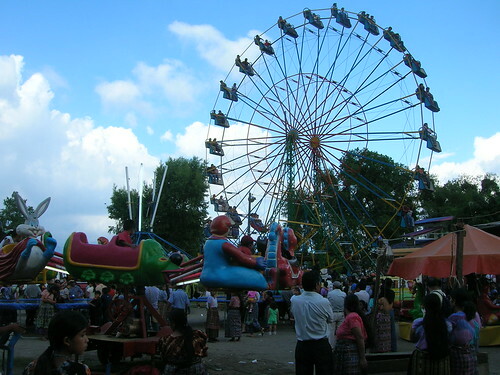 Life in Guatemala, while satisfying, isn´t exactly OSHA approved. There are plenty of corners cut in day to day life that in the states would generate countless lawsuits. Here, people are left to their own common sense with a lot of things. For example, there are no fences around this ferris wheel so you can walk right into a chair rotating up and knock oneself out. If you do it´s your own damn fault. The Ferris Wheel looked mostly familiar, although it was a little disconcerting to see that it was powered by the front end of a tractor. But if the locals trust it, I will too. So I paid my 5 Quetzales (about $0.60) and Vym (a great Dutch amigo of mine) climbed aboard. 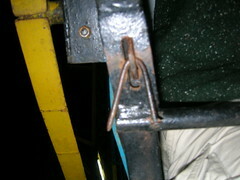 I started getting nervous when I saw that the ´lock´ holding the restraining bar in place was an old bent and rusty nail. Slowly we ratcheted up as it loaded getting better and better views of the festival. And then, once loaded, it started rolling faster. And faster. And faster. Suddenly I realized this was nothing like wheels I´d ridden before. They were for the view. This was for the ride! It got so fast that the centripetal forces flipped us around in the chairs as we felt like we were being hurled out over and into the crowd of hundreds. Suddenly, it dawned on me that that the Dutch are some of the tallest people in the world and that Vym is no exception. He was complaining earlier about never being able to find clothes down here large enough to fit him and I know I certainly could spare to lose a few pounds. As we were hurled up I started to wonder if they had planned for huge Gringos to sit in these tiny seats. That thought combined with the rapid rotation and the rusty nail led to a blissfully terrifying endeavor. By the time it slowed down we were laughing, delighted at our survival, pulled out cameras and started snapping pictures. Then it started going backwards.